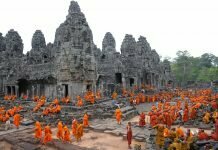 Cambodia often impresses travelers with many famous historical sites, ancient temples, beautiful landscape and unique cuisine. However, if you would like to explore Cambodia in a completely different way, do not miss trying these activities below. Battambang is the second largest city, located in northwestern Cambodia. Known as the largest granary of Cambodia but the reason that attracts tourists of this city is bamboo train, a unique mean of transportation that can only be found in Cambodia. This bamboo train is simply made of pieces of wood and attached to a motor. The rail line stretches all the way down to the capital of Phnom Penh, but the tracks lie in complete abandon and disrepair, meaning the bamboo ride only runs 7 kilometers in length to a nearby village and back. 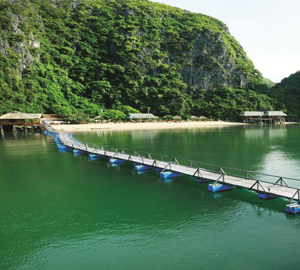 At the present, the bamboo train still is put into operation to meet the need of tourists. One of the interesting experiences that you cannot ignore on your Cambodia trip is visiting the large freshwater lake Tonle Sap. Tonle Sap not only is the richest fishing lake in Cambodia, but also attracts tourists by beautiful natural scenery and local life. 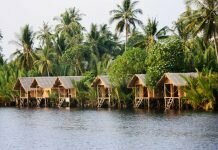 The lake plays important role in local people’s life so they learned to live in harmony with nature by building floating houses. Visiting Tonle Sap, you can take a boat tour on the lake to admire stunning scenery and discover the daily life of people in here. The famous riverside Kratie is home to the Irrawaddy Dolphin, a very rare freshwater dolphin in the world. Currently, the Irrawaddy dolphin is an endangered species, only 66 dolphins in the world living in the Mekong region of Cambodia. So, it would be a very exciting experience if you could watch this rare dolphin with your own eyes. Traveling to Cambodia, you will have the opportunity to enjoy the pristine beauty of the beaches on the islets off Sihanoukville. 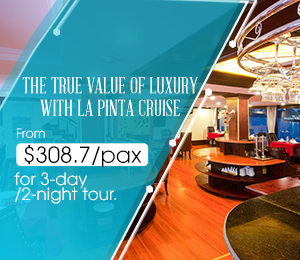 Taking the boat tours to visiting the beautiful islands surrounding such as Koh Rong Saloem, Koh Russei or Koh Pos, you will be overwhelmed by the pristine beauty of the golden sands and the blue sea, immersed yourself in peaceful and quiet space. Many travelers still think that tuk tuk is only available in Thailand, but it is also a very popular mean of transportation in Cambodia, especially Siem Reap. Taking a tuk tuk tour is one of the best ways to discover the city and these drivers are also experienced tour guides for you. A very interesting experience you should not miss trying in Cambodia is watching the sunrise or sunset on the air balloon. This is a great chance for you to admire the amazing view of Angkor Wat from above as well as take the nice pictures. 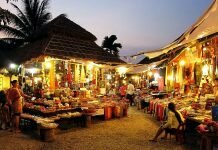 Phsar Chas is a market located in the heart of Siem Reap City with over 100 stores selling all kinds of products at affordable prices. The most popular items that visitors often buy as souvenirs while visiting the market are traditional silk and silk products. Angkor Zipline in Siem Reap is located within the Angkor Archeological Park, the home of 1000 year old ruins of Angkor Wat, Angkor Thom and many other famous temples. It is the only zip line experience in the world to be held in a UNESCO World Heritage Site. The site was engineered by ziplining experts and meets stringent world safety standards. If you concern about things to do and travel guides in Cambodia, please visit our website. Like or share if this post is helpful for you!